As a kid I didn’t go camping. It wasn’t a “thing” to do where I grew up. One time we did spend a weekend “Down The Islands”, but my memory of the weekend is lost. The only evidence of the trip is one picture I still have. 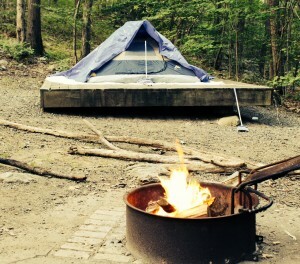 I did my 1st camping trip as an adult in April 2013, which was a postponed trip that was supposed to happen the weekend after Hurricane Sandy landed on the East coast. Except for the fact that it was WAY too cold, it was a great experience, leaving me wanting to do it again. What I didn’t want to experience again was sitting around a campfire trying (in vain) to keep warm and having the smoke invade my eyes, hair and clothing. YUK!!!! I realized during that trip that I really prefer drive up camping (because really, I don’t know how to go small) and having a raised platform on which to pitch a tent. The Mahlon Dickerson Reservation is small campground with hiking trails. Its approximately 3 miles from the main highway, at which the turn off has a gas station, supermarket, etc. My next camping trip during the summer of 2013 was combined with a tubing trip. After being on the LAZY river for 4+ hours, I was thankful I had already decided to camp the night instead of driving the 3+ hours back to NYC. This time, I got a lean-to to stay in. By far, it would be my #1 choice. It rained heavily that night and I was really happy for my foresight to get a lean-to. These covered platforms protects you from the rain and probably some of the cold. The campground was at the end of the route for tubing. Landers River Trips offers Rafting, Canoeing, Kayaking, Tubing and has 3 campgrounds. I stayed at the Narrowsburg campground which had showers, a playground and even a hangar which was used for a party that night. Those 1st two trips were not planned by me. I only had to show up at the designated location with all my gear. For the trip this past weekend, I did all the planning. Whew – planning is not much fun. 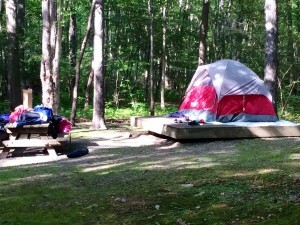 Originally I was planning to go to Beaver Pond State Park campgrounds. After reading the any reviews about the noise, I decided against it. As well, getting 2 adjacent and available camp sites on a Saturday night was proving to be impossible. Since I was taking the kids along, the lake to bathe in as well as the available playgrounds was a big plus to this site. Alas, there wasn’t any room at the inn. I decided to go with Mahlon Dickerson again. Its a little over an hour from NYC and I remembered that it was clean and we could hike if we wanted. The police had routinely patrolled the site on my 1st visit there and therefore I felt it would be a safe place to stay, and even leave the camp site unattended if we all decided to go for a hike (we didn’t). Planning for a trip where you will not be in walking distance from a store means you have to think of everything beforehand and remember to pack it. I had a list – that I checked over and over and over. I purchased one of the Cargo boxes to mount atop my car. Genius move! This thing is HUGE. A whole lot bigger than I was expecting and I definitely needed the space. All the camping gear and clothing went atop the car, the food stayed inside the car. My trusty tabletop grill and more than enough cans of propane was packed inside as well. Chocolate Chip Pancakes – from scratch! As you can see from the above menu, there was lots to prep and pack. To make it easier for myself on the site, the potatoes were peeled and sliced and kept submerged in cold water (to prevent browning), the dough for the roast bake was kneaded and kept cold in a greased glass bowl. Mac & Cheese was baked at home and reheated on site. Dry ingredients for the Pancakes and Monkey bread were mixed and bagged at home. Remembering to pack all the accompanying ingredients had me double and triple checking. Having S’mores for the 1st time is a really cool experience. The kids were more than happy to melt their marshmallows over the fire. 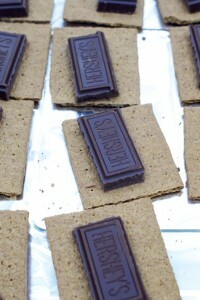 To make it easy, I added the blocks of chocolate to the Graham Crackers and then placed them on foil inside the grill to melt the chocolate a little. 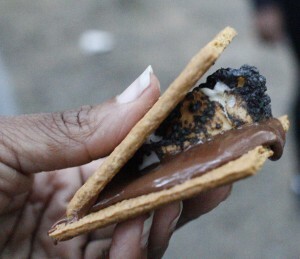 Once their marshmallows were nice and toasty – OK a little burned – the S’mores were built. The gooey mess was quite the hit! One of the things I was really looking forward to cooking was the roast bake on the open fire. I was rather disappointed however, that it started raining just as we were starting to prepare breakfast. So there I was standing at my gas grill flipping pancakes on my new Lodge Reversible Griddle while my niece is standing next to me with an umbrella covering the grill. 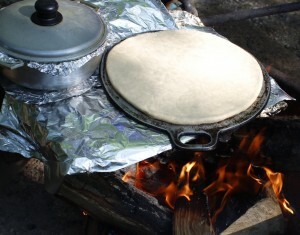 Finally the clouds cleared and I excitedly grabbed my rolling pin and rolled out my dough, transferred it onto my tawah and then placed over the open campfire. Yay!!!! I watched as the dough cooked, flipped it over and waited. 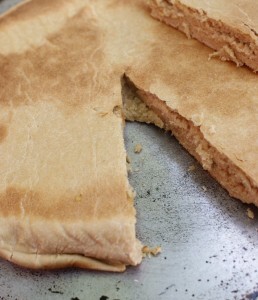 Mmmm…fresh hot bake ready to have butter melt on it! Dang…it was good. Even after having a full breakfast, the kids (OK – me too) devoured the roast bake. While the bake was cooking, the monkey bread was cooking as well. I’d never had it before and figured it would be a good mid-morning treat for us. It didn’t disappoint. 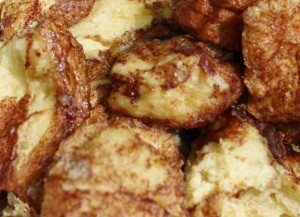 Monkey bread is made by cutting up Pillsbury biscuit dough into quarters then coating the pieces in a mix of cinnamon and sugar. The pieces are then placed into a dutch oven and melted butter is poured over it. Cover and cook over the open fire. Tastes similar to cinnamon buns. I just might make some at home as well. All in all, we were all well prepared for this trip. I own two tents a smaller 7 ft x 7 ft tent and a new Coleman Flatwoods 7 ft x 9 ft tent, which I must say is a whole lot bigger and nicer than the smaller tent. As well, when it rained early Sunday morning, the inside remained completely dry. The kids (3) slept all by themselves on one site and the adults (3) slept on the other site. I’m very proud of the kids who didn’t protest at the thought of being alone in a tent all night. Nor did they complain of being in fear by the next morning. Of the 6 of us, my daughter and I were the only two who had camped before. Everyone had such a great time that we’re looking at planning another trip very soon. 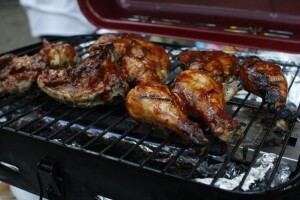 5 – I could do this all the time!! !